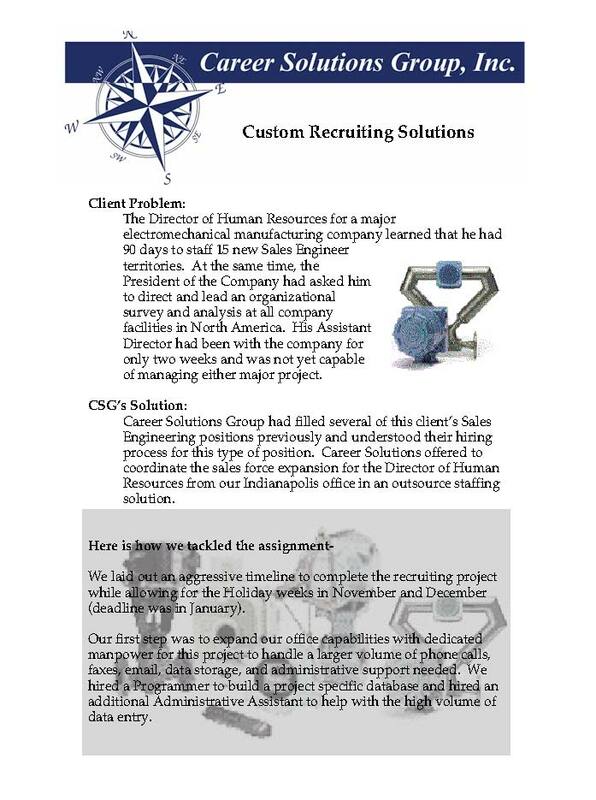 The Director of Human Resources for a major electromechanical manufacturing company (Emerson Electric) learned that he had 90 days to staff 15 new Sales Engineer territories. At the same time, the President of the Company had asked him to direct and lead an organizational survey and analysis at all company facilities in North America. His Assistant Director had been with the company for only two weeks and was not yet capable of managing either major project. Career Solutions Group had filled several of this client’s Sales Engineering positions previously and understood their hiring process for this type of position. Our staff had a working knowledge of the company's technology in chemical process automation, control and instrumentation for process flow, level, temperature, pressure measurement in oil & gas, petrochemical, pharmaceutical, food processing, and other applications. 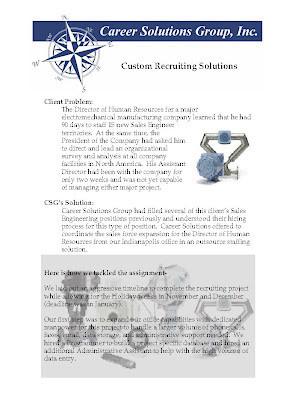 Career Solutions offered to coordinate the sales force expansion for the Director of Human Resources from our Indianapolis office in a recruitment process outsource (RPO) staffing solution. We laid out an aggressive timeline to complete the recruiting project while allowing for the Holiday weeks in November and December (deadline was in January). Our first step was to ramp up our capabilities for this project to handle a larger volume of phone calls, faxes, email, data storage, and administrative support needed. We hired a Programmer to build a project specific database, hired three Staff Recruiters, and an additional Administrative Assistant to help with the high volume of data entry. Our office coordinated communication between 14 of our client’s regional offices around the US, four other external Recruiters (Houston, Minneapolis, Boulder, and Austin), and several hundred potential candidates for the 15 positions. 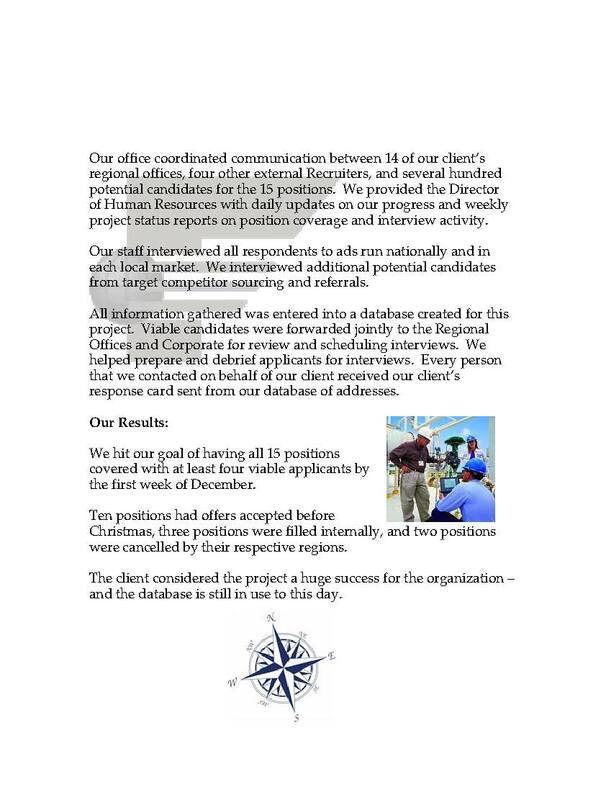 We provided the Director of Human Resources with daily updates on our progress and weekly project status reports on position coverage and interview activity. Our staff interviewed all respondents to ads run nationally and in each local market. We interviewed additional potential candidates from target competitor sourcing and referrals. All information gathered was entered into a database created for this project. Viable candidates were forwarded jointly to the Regional Offices and Corporate for review and scheduling interviews. We helped prepare and debrief applicants for interviews. Every person that we contacted on behalf of our client received our client’s response card sent from our database of addresses. We hit our goal of having all 15 positions covered with at least four viable applicants by the first week of December. Ten positions had offers accepted before Christmas, three positions were filled internally, and two positions were cancelled by their respective regions. 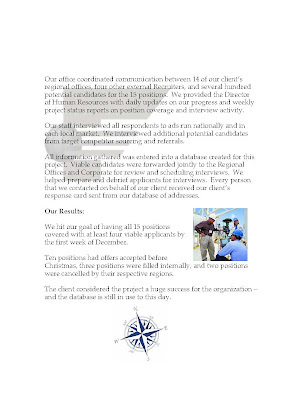 The client considered the project a huge success for the organization – and the database is still in use to this day.